The Talbot has history. It’s typical of coaching inns all over the country and this one, in particular, has a story – well, probably many. It is said to have provided the venue for assignations between Lord Nelson and Lady Hamilton in 1798. There is a brass plate bearing Nelson’s name on one of the wooden banquettes, so it must be true! Yes, The Talbot is one of the most striking coaching inns and it’s refurbished to a high but sympathetic standard with modern facilities and technology that any present-day guest might expect. The restaurant features a stunning copper ceiling in the original building but there is also a newer glass-walled extension overlooking the summer terrace and garden, which is ideal for dinner on a warm evening. It was on one such rare evening that we visited. There is that cosy bar with its 15th Century beams and open log fires where Horatio once sat, and then one passes through to the light and contemporary garden restaurant. Yes, it’s contemporary but it takes advantage of that perfect view over the original back garden with its charcoal-black furniture. If Will Shakespeare had a garden then it would likely have looked like this – if he had a lot of friends who enjoyed barbecues. 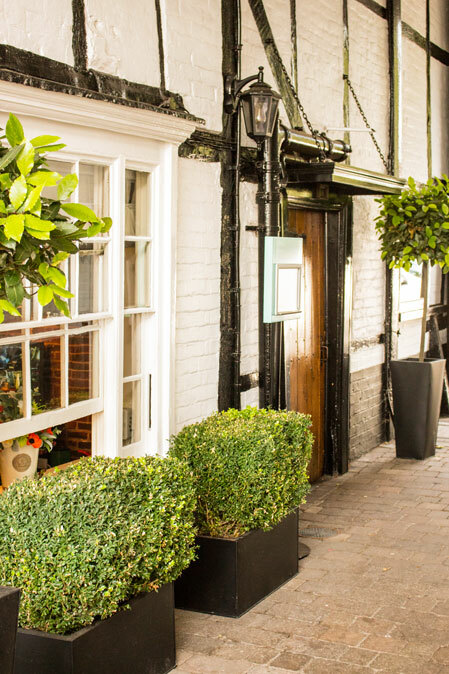 Since 2008 The Talbot has annually been awarded an AA Rosette, AA Breakfast and AA Dinner Award and been voted ‘Best place in Surrey for a winter lunch’ in a Surrey Life poll. I was expecting good things of this meal, as now former two-Michelin-star chef Martin Blunos has joined as head chef. He is an instantly recognisable character with a moustache as his trademark and outstanding cooking skills as his trade. We began our meal with Coco’s Pea Purée. 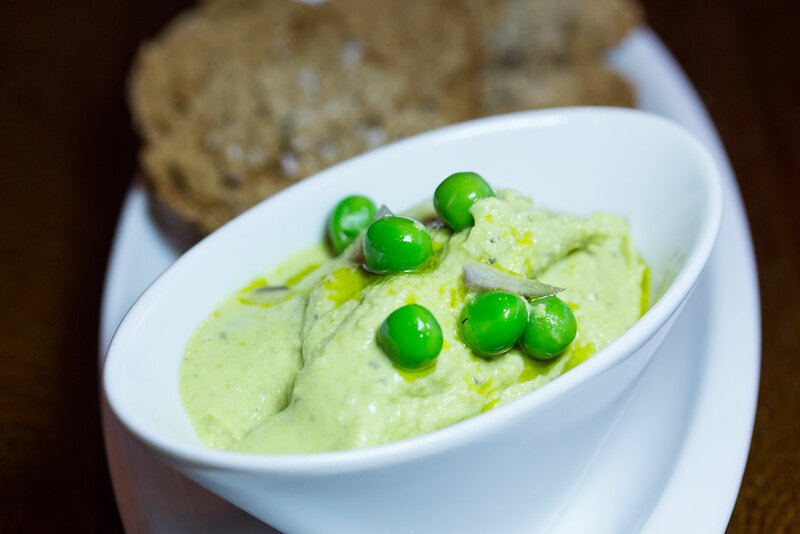 No, this isn’t a melange of chocolate and vegetable but actually an addictive fresh green pea dip and named after Martin’s daughter. A winner, and appropriate for the season. Then my starter was mushrooms on toast with a hint of blue cheese. The mushrooms were delicate and could easily have been overpowered by the sharpness of the cheese, but the chef had a light hand and presented a dish that was outstanding. My guest chose the ham hock terrine served with cauliflower, piccalilli and toast. The meat was hearty, a healthy pink and substantial. This is a classic in many a restaurant and very often a shadow of what it could be. Here the terrine showcased good ingredients presented well. 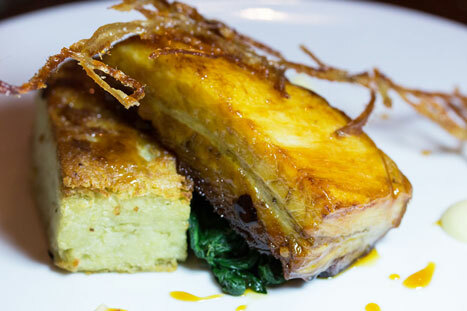 My main dish was slow-cooked pork belly with a potato cake. OK, belly of pork was once a cheap working-class mid-week dinner but it was always flavourful. Now it’s popular on restaurant menus and it’s one of my favourite meals. The Talbot has a succulent, melting, deliciously fatty version that could likely convert a vegetarian! It’s a must-try here when it’s on. We were also intrigued by the side dish of Dirty Carrots. They were lightly cooked carrots with a dressing of ‘dirt’ made from, I assume, charred vegetables. Whimsical but working well. My guest pronounced his main dish of ox cheek with parsnip purée as excellent. Once again a classic but often variable in quality in other establishments. The Talbot presented a generous portion of tender and flavourful meat which illustrated why this dish had become so popular. Martin Blunos has a charming take on desserts. I chose a Malteser! 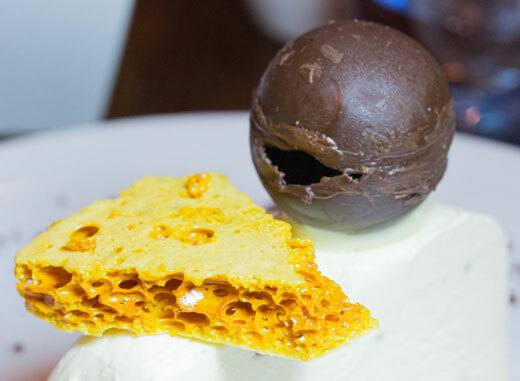 A sphere of chocolate atop a slice of vanilla parfait with a wedge of cinder toffee. Actually I would more liken it to a Crunchy than a Malteser but it was a fun presentation and delicious. My guest is a northerner so his eye was taken by Eccles Cake with Mrs Kirkham’s cheese – a rich, hard, pressed full fat traditional crumbly Lancashire cheese from raw milk. It’s that combination of sweet from the dried fruit and savoury richness from the cheese that is so appealing. A manly portion and an original end to a delightful meal. A Blunos adaptation of the traditional fruitcake and cheese. The Talbot will, I feel sure, become a destination restaurant. It’s just 40 minutes or so from central London so it’s easily accessible. Any tourist would love the history and ambiance and I defy anyone not to be impressed by the food. Martin Blunos has proved once again that he has wit, imagination and culinary flair. There must be more awards on the way.